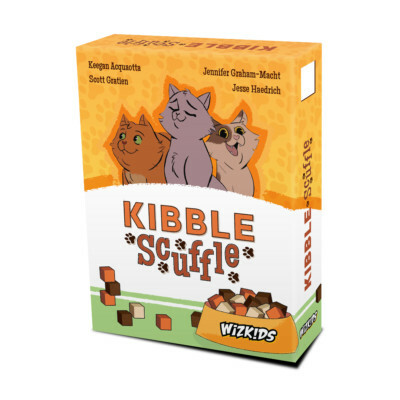 WizKids Announces Kibble Scuffle, it’s time to feed your cats! WizKids is excited to announce that Kibble Scuffle, an adorable romp through feeding time with your mischievous feline friends, is coming soon! In Kibble Scuffle, it’s time to feed your cats! Players compete to feed their cats the most points in food cubes by the end of the game. They will send cats to Food Bowls by playing cards, and resolve the cats’ abilities as they arrive. When there are at least 5 cats at any bowl after resolving abilities, the Feeding Phase begins. Players are able to feed their cats and collect food cubes, which are worth varying amounts of points. When a player reaches 20 points or more at the end of a Feeding Phase, the game ends and the player who has the most food cubes wins. There are several different kinds of feline friends to feed in Kibble Scuffle—from the generous Mama Cat, who allows another cat at the bowl to feed, to the mischievous Trickster Cat, who exchanges food cubes between bowls. The game even features four adorable Kittens, who draw their fellow kittens to the Food Bowls. Kibble Scuffle’s innovative packaging doesn’t just hold the game—the box also doubles as the game’s Cat Food Box, allowing players to have the most immersive feline feeding experience possible! Kibble Scuffle arrives in game stores soon, so be sure to preorder it today!